Simple, unique and elegant designs are pleasing to the eye and become a focal point. Durable construction and finishes are designed to stand up to heavy use applications. Trough sinks prevent unsightly and unhygienic standing water from accumulating on counter space between sinks. 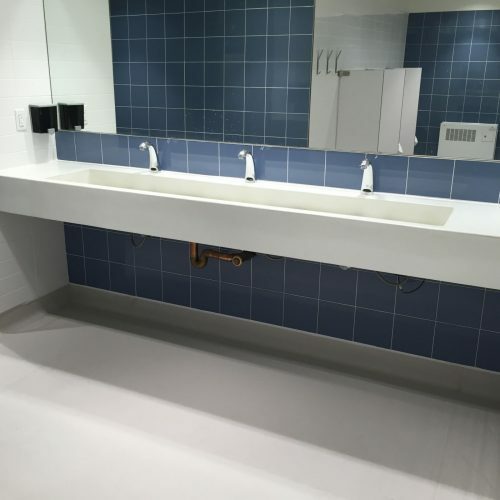 One piece designs eliminate caulking joints and seams around drop-in type sink basins which can accumulate mold and bacteria. Most Profiles are ADA compliant, barrier-free (wheel chair accessible) applications. They can be easily suspended from the wall. Each sink is custom built to fit exact space requirements. All dimensions are changeable to meet any design specification. A variety of trough styles and drain designs to choose from. 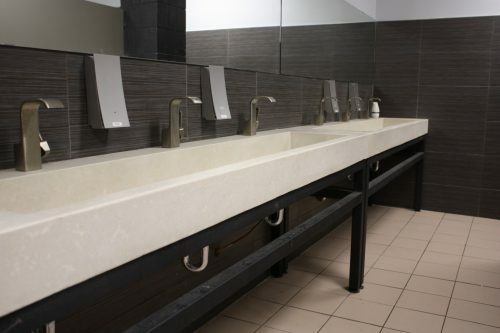 As part of a complete commercial washroom renovation, this entertainment facility recently received a facelift, which included trough sinks created by EverGreen. 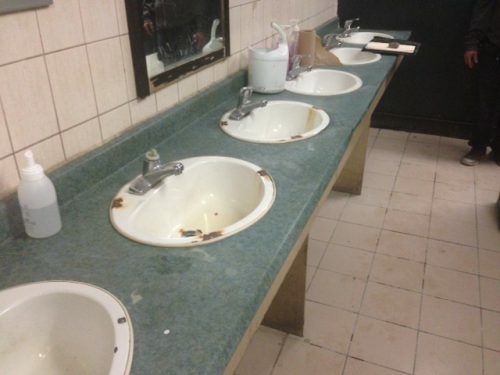 OK maybe this one might be considered an extreme example , but outdated, worn-out multiple sink commercial washrooms can be found everywhere. Excess counter top collects used hand towels, standing water, garbage etc. The drop-in sinks collect bacteria around the edges. If you are truly looking for something different, you should take a closer look at what we can do. 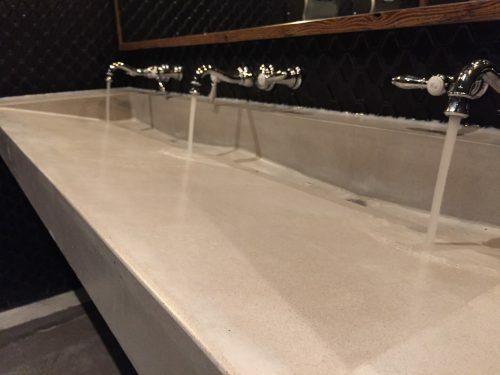 We specialize in designing and manufacturing unique concrete washroom sinks for any application, commercial or residential. Our infinite selection of colours and textures , combined with the ability to integrate our many sink styles and countertops as one piece make each creation truly unique. Our sinks are specially designed and formed to exactly fit your space, whether it”s for an existing or new vanity or even suspended from the wall. We also make custom sink shapes for unique spaces or styles.